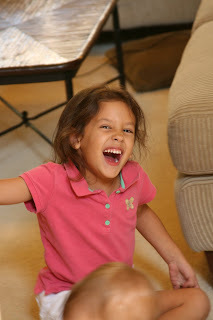 This girl always makes me laugh :) Joey took this picture a couple of weeks ago and it captures her personality perfectly. She is a spunky one thats for sure! She says the most "hirelious" things and makes the cutest facial expressions. She has a style all her own and loves to dress herself-I love to see the clothes and accesories she picks out:) She is also quite the dancer and has taught me a few moves:) She is doing great in preschool with learning her letter sounds and even reading some words. She is very friendly and gets along great with other kids. She loves to make her own lunch and help me with the laundry and dishes. She has also taken on the role of big sis so well and is so so sweet to our little Cali. I will be sad when she isn't with me everyday next year:( So, I'm treasuring every minute right now! She is just a great little gal with a special little spirit. We don't know what we'd do without our Ella! Love you Ella bean! I love that picture of her. She's certainly a spunky one, gotta love her! I miss you guys! That picture really does show her personality! She really is a spirited little thing. Everything you said is true. She is such a jewel!! She is such a cutie!! All your girls are! I got a few in my family too. She is so adorable in that photo. I think your daughters are all so special in each their own ways, and so beautiful too. I think it's wonderful that you let them know how special they are to you all the time. My parents never ever did and so I never thought I was. Your parents should think you are pretty wonderful. As an adult I know that they do think me special, but it would have been nice to have known that when I was a kid. Know what I mean? very cute. i love it when they try to say something and it comes out wrong. I love this picture of Ella. I agree with Marie I think it's great that you always tell the girls how special they are to you guys and they are to us all too. I love when they try to say the words and new word is "coined" too cute. Joey used to say I want some "memon" for finadeni because he would see us put lemon in the finadeni I guess he assumed it was "memon". Gotta love these expressions and more importantly the ones behind them too cute. Ella is so cute! I love that picture of her. I LOVE her spunky personality, she reminds me of my SAVY! Life just wouldn't be the same without that fun little spirit!